It’s finally here. I understand you are probably not even half as excited as I am, but we are now the proud owners of a brand new Kenmore bottom freezer refrigerator. We have been wanting, maybe needing this for years. And we are so excited. This is the best (& most expensive) appliance we have ever purchased. It was partly a gift from Sam’s dad for Christmas, partly a purchase from our tax return for this year. Look at all the space in this thing. Loading it up was slightly reminiscent of moving into my kitchen (in this house) for the first time. SO MUCH space…where do you put everything. 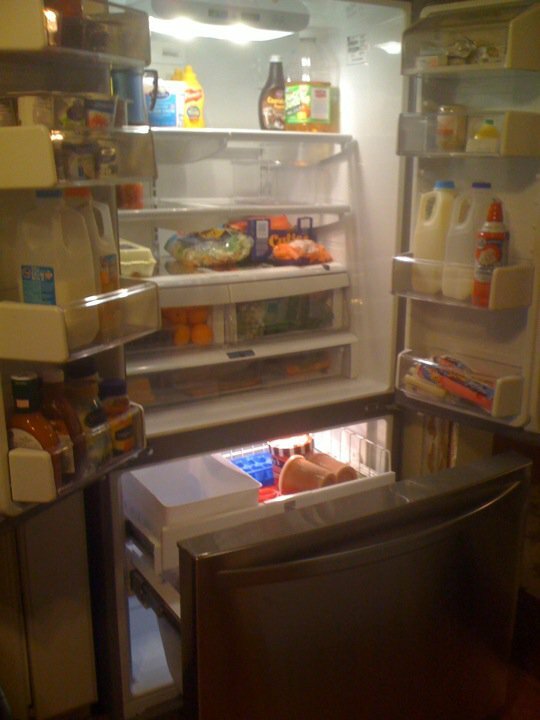 In our old fridge all this stuff pretty much filled it up. The new one has completely empty shelves! And its so bright! 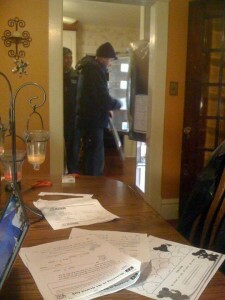 One of the things I really love is that our fridge opens into the doorway that leads to the dining room. Before, you couldn’t even get past the door if it was open. Now you can open it up and still walk through the doorway. That is just awesome, I tell you. Lovin’ it! Also, with the bottom freezer, the items in the fridge that are so desirable to a three year old are just not quite as accessible. That’s a good thing! We did have to sacrifice a cabinet in order to fit it in. 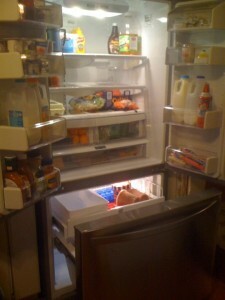 Here you see our new fridge, open, but can you see the molding on the doorway that is missing? The cabinet we had to remove was above our old fridge. We soon found out that no fridge is made that small anymore, and since the cabinet was basically resting on the old fridge, it had to come out. We considered rebuilding it and just chopping off the bottom, but after the work it took to get it out, we decided it wasn’t going back up. Hopefully within 3 years we will be redoing our cabinets anyway, so it’s just temporary. My kitchen is currently a disaster area. I did take a picture of the mess…but I am not posting that! Our counters are completely filled with boxes of food that used to be in that old cabinet we tore out. So tonight, after the fridge was loaded I cleaned out completely two of our cupboards to rearrange a bit. Our old “spice cupboard” next to the stove is now the cereal cupboard. The old cookbook/baking, sprinkles, food coloring, colored sugar, etc. cupboard is now home to all our lovely spices (- four which I couldn’t fit in). Now I have about 20 cookbooks and all that baking crap that I basically only use at Christmas and Easter to find a place for. I’m thinking of eliminating some of it. And the rest may go in the cupboards that are above our “peninsula counter” which are kind of hard to get into. I’m thinking there because we rarely used them. But my kitchen is still a mess. This is going to take days to clean up…I think. Of which, this week, I have very few. So I may be living with the mess for a week, maybe. That doesn’t make me very happy. There is a snow advisory tonight and many are hoping for a snow day. Wow, that would be SO nice right now to have a bit of extra time to get this place back in order! 2 Responses to New Arrival! AWESOME! I’m so jealous (in a good way)!